Wide selection of self catering cottages ranging from 1 to 6 bedrooms. 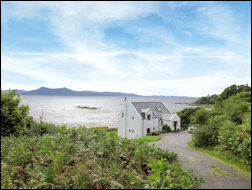 Locations throughout Skye overlooking the sea and mountains. Purpose-built self catering cottage. 8 miles south of Portree. 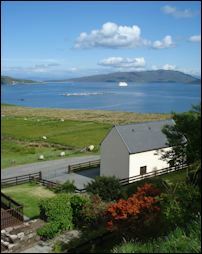 Superb views of countryside and the island of Raasay. Lots of local wildlife may be spotted. A sandy beach is just 5 minutes walk from the cottage. Located on a small working croft in the community of Braes. Sleeps up to 5 in 2 spacious bedrooms. Linen provided. microwave, washing machine, dishwasher, etc. Fenced garden safe for children. Cot available. including electricity, bed linen, towels. 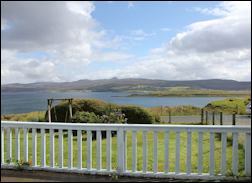 Traditional croft house in stunning location with views of Raasay. Within easy walking distance of sandy beaches. Look out for dolphins and sea eagles. Located 5 miles south of Portree. Fully equipped and refurbished to a very high standard. Polished hard wood flooring throughout. Sleeps 2 - 6. Ideal for families. Laptop with BT Broadband Internet access. 1 twin room, 1 double room, bathroom. electric oven, gas hob, microwave, fridge/freezer, etc. Lounge with Sky TV, VCR, DVD, leather sofa and sofa bed. Garden with swing and BBQ equipment. Prices: £380 - £700 per week. Includes linen, towels, electricity, coal, peat, logs.